Greta Van Fleet is the band on everyone’s lips right now after winning the award for the best new artist at the legendary Loudwire Music Awards. Very much in demand, I was fortunate to be offered the opportunity of a slot in their busy press schedule where I caught up with guitarist Jake Kiszka to discuss the band’s plans for their global takeover. Opening the chat, I was keen to discover how the band had dealt with their newfound celebrity status. Jake Kiszka: I think that we have taken it quite well. A lot has happened for us in such a short span of time. ANTIHERO: Was there a single factor that you can pinpoint that has made the world sit up and take notice of the band? Jake Kiszka: I am not really sure, you know? If I tried to identify why… I guess it’s just that we have written music that is truthful to us, real music, you know? Putting your soul and your heart into it. People can hear that and they have reacted to it. ANTIHERO: Has it been easier or more difficult being in a band with family members? Jake Kiszka: (laughing) Well, it can be, or it can be the opposite. It hasn’t come down to fists thrown at some point yet. It has actually been great. The fact that we all grew up together we share a lot of similar influences. That certainly helps. Especially when it comes to the musical process that we know what the others are thinking. That gives us the ability to all share a similar page. However, on the flip side of that is when it comes down to artistic differences it can be a bit brutal at times, but not anymore. ANTIHERO: I have read that your father had adopted quite an original incentive scheme during your early career progression. Is this still something that is ongoing? (He upgraded Jake Kiszka’s guitar each time he showed significant progress). Jake Kiszka: (laughing) He’s stopped now. He was instrumental in shaping my career. He would make me learn a certain set of songs, from when I first started out on a little basic acoustic guitar.That was before I could get my first electric guitar. I mastered those and then I got my first electric guitar and he would give me more substantial songs to learn. Then he would upgrade my guitar to the next one that I would need. He was definitely instrumental in improving our ability to want to play, I guess. ANTIHERO: The band always seems to be on the road and relentlessly touring. Any plans to spread those wings a little further and perhaps come over to Europe. 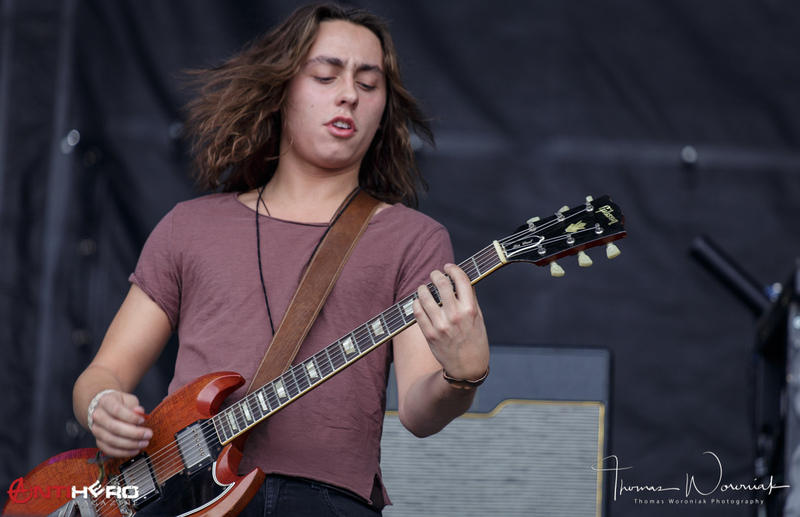 Jake Kiszka: Certainly, the plan for the next year will consist of bigger venues and bigger festivals, more countries, and we have a European tour coming next year – Germany, France, and the UK. ANTIHERO: Will those be headlining shows or on a support with larger acts? 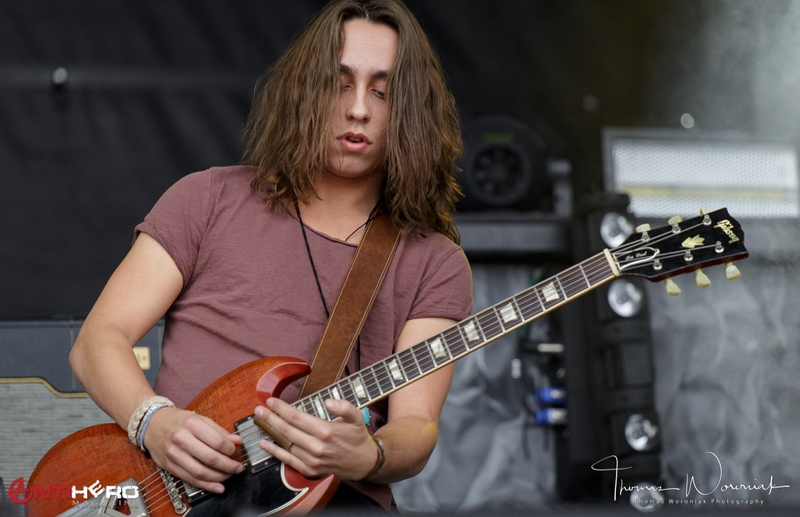 Jake Kiszka: I am not sure, I think that it may be opening for some bigger acts, and then doing some of our own headlining shows as well. ANTIHERO: Will you be touring right through until Christmas or do you actually get a little time off? Jake Kiszka: Not too much time off-we are doing just a short leg. We will be back for Christmas on 21 December and then in January from 1st its back into the studio. For that month we are working on our first full-length album. ANTIHERO: The two EPs that you have brought out this year was that all old songs or a mix of old and new featured on there? Jake Kiszka: It was variety and mix of the two. A mixture of what we had written five years ago. “Highway Tune“, for example, was the very first tune that we had ever written. It varies and there is also some more contemporary stuff like Black Smoke Rising which was actually recorded a week before the first Ep was actually released. We decided to record it and actually stick it on there. That gave the first release its musical direction in a way. ANTIHERO: Just returning to the band’s forthcoming debut album. Have the band already written songs for that, any ideas already earmarked for that release? Jake Kiszka: Yeah some of those songs are already very close to being done. There are some songs that we are constantly writing and are constantly demoing. We have assimilated quite a few songs. We will be going into the studio and maturing those tracks, so yes there is quite a bit of material written already for the first album. There’s some that go back a few years but also a lot of stuff that we have just finished writing also that will find its way also onto the album as well. We already have a producer and a studio lined up for that. Our current producer will be working on the forthcoming album as well. ANTIHERO: In terms of album artwork will that be something that the band will continue to have direct input into? Jake Kiszka: We usually do. I designed the artwork for Black Smoke Rising, but we didn’t actually have time to do it ourselves on From The Fires, and we hired an artist to do that. She sent us ideas for the artwork and we suggested changes. It is now time to involve other artists to be able to do artwork for covers and stuff. In terms of an album title, we don’t have anything in mind as yet. ANTIHERO: From the Fires features a couple of cover versions. Why did you choose those particular tracks to do? What is your objective when you cover a song? Do you try to capture the essence of the original or just totally reinterpret it entirely in your own style? Jake Kiszka: We generally like to put our own take on them. We wanted to do a folk song so that was Fairport Convention – [“Meet on the Ledge”]. Then there was something to showcase our Soul influences, so a song by Sam Cooke – [“A Change Is Gonna Come”]. ANTIHERO: Your musical influences are widely reported and known. Anything that you currently listen to that would surprise people? Jake Kiszka: You know growing up we were surrounded by a lot of vinyl and things like that. There were a lot of influences and there’s more traditional you know blues records. Roots blues Muddy Waters. Elmo James and Robert Johnson Traditional music Woody Guthrie, like Joni Mitchell and Bob Dylan and Joan Baez. You can see the third evolution of influences from the traditional. Yeah, there are a variety of elements there is a large eclectic mix. ANTIHERO: OK. As I mentioned earlier the band have appeared to have just suddenly exploded onto the scene and be everywhere. What made you decide to do this music full time? Is this going to be your full-time career? Jake Kiszka: It wasn’t that we set out to have a career in music. It was just the four of us creating music and jamming. Creating a body of work. Someone found us, and we were kind of thrown into it, they got on board and supported us to have a career in music. It just seemed that we were all kind of built to do it. ANTIHERO: 2017 has been a great year for Greta Van Fleet, but what realistic goals do you have for the year ahead? Jake Kiszka: Next year we are definitely looking forward to getting the first full-length album released. That could be early to mid-next year. I guess also to build on the reputation that we already have to establish more credibility. As I said, bigger gigs and festivals and as I said to visit more countries, including the UK, as well. That’s what we will be working towards next year. ANTIHERO: Thinking of all the influences that we discussed would there be a single song that for you always takes you to a particular place mentally every single time that you hear it? Jake Kiszka: Man that is a great question. There actually is, there are a few songs that can do that.I don’t know if you are familiar with Dillard & Clark Through the Morning, but that song is really quite emotional and quite moving. Also, “When the Wind Cries Mary” by Jimi Hendrix. Jake Kiszka: Who would that be? I think I would like Liam Gallagher, right. ANTIHERO: That’s what a surprise. Are you a fan of his music or just him as a public and media figure? Jake Kiszka: Oh yes. I am definitely a fan of his music, for sure. ANTIHERO: It’s quite a surprise because I mean I would never come through your music. Jake Kiszka: Yeah, it’s certainly well-hidden. ANTIHERO: Thanks very much for joining us. Hope to see you in the UK next year. Thanks again for taking time out of your busy schedule. Jake Kiszka: Yes, definitely. Thanks very much. Thank you.